Indoor water parks are a great part of summer. They are inside away from the hot summer sun and they are designed to keep families entertained for hours on end. Indoor water parks are also ideal for winter when it is cold and snowy outside but kids still want to play in the water like it is summer all over again. 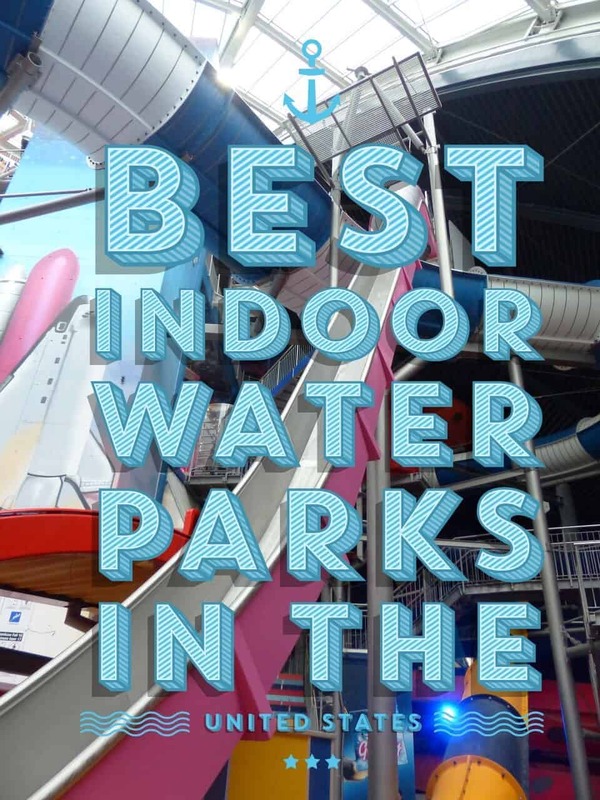 Here are some of the best indoor water parks in the United States. Related: Plan a Family Getaway to the Best Lake Vacations in the U.S.
Wilderness Territory Waterpark Resort– The Wilderness Territory Waterpark Resort is located in Wisconsin Dells, Wisconsin. This 600 acre resort is made up of four water parks: Klondike Kavern, Cubby’s Cove, Wild West and Wild Water Dome. It is the largest waterpark resort in America. Their popular attraction is the Hurricane, a raft ride that plunges 58 feet then spins into a funnel that simulates a hurricane. There is also the Great Wave, a 15,450 square foot wave pool. Splash Lagoon– Splash Lagoon is located in Erie, Pennsylvania. Splash Lagoon was opened in 2003 and is an 84 degree tropical atmosphere. It features nine water slide along with a 12-level interactive treehouse, an Aqua Tumbler and a Wild Water Wave Pool. This wave pool is 200,000 gallons, making it the largest indoor wave pool in the eastern United States. Splash Lagoon features the Tiki Treehouse, an attraction that is half obstacle course and half fortress and features water slide, bridges and a large bucket of water that splashes down on guests. The Black Hole water slide is a tunnel slide where you are in darkness from start to finish. Great Wolf Lodge– Great Wolf Lodge has numerous indoor water parks throughout the US, including Washington, Pennsylvania and Virginia. This water park has something for everyone in the family to enjoy. Thrill seekers will love the River Canyon Run, where riders sit in a round raft and drop six stories while sailing over 500 feet of water. Younger kids will love the Cub Paw Pool, featuring mini water slides and stationary jet skis. KeyLime Cove Indoor Waterpark Resort- KeyLime Cove Indoor Waterpark Resort is located in Gurnee, Illinois. This 65,000 square foot water park features a ton of bright and bold colors. The Hurricane Vortex is where riders sit in a raft and are swirled around an orange and yellow bowl at 40 miles per hour before being dropped 44 feet down into a pool of water. Toukie’s Big Deluge is a huge interactive play area with games and water slides. DIY Duck Tape® Tombstone Makes Fun Halloween Project! Thanks for sharing this information, I wasn’t even aware that we has indoors water park! I have heard a lot of great things about Great Wolf Lodge. Splash Lagoon isn’t too far from me and would probably make for a really great trip! Whoa! I didn’t know there are indoor water parks! That looks like so much fun! Splash Lagoon is always on my mind. I really wanted to check that out. We live in Arizona and most of what we have are outdoor water parks, which I understand since it’s always hot here! But as a person that really can’t stand this heat, I would very much prefer an indoor water park. I guess it’s time to visit some of the cooler states! These are some great ideas! Will keep this in our back pocket for our next vacation. We recently visited Great Wolf Lodge. My kids ask to go back daily. Awesome list! We live within driving distance (road trip driving) of quite a few of these. Will have to check them out when the kids are a little older. Thanks for sharing. The only one I’ve tried so far is Great Wolf Lodge, and that was really nice! I need to visit the others now! The Great Wolf Lodge is awesome!!! We are planning a trip there, thanks for sharing. I have never been to an indoor water park, I would love to go to this one! Not close to any on this list, but I agree indoor water play areas and pools really are the best for all seasons. I know we like to use our gym’s pool all year round. these look so fun–my kids will love them! I’ve only been to Great Wolf Lodge and loved it. I can’t wait to check the others out. These look so awesome! I’ve always wanted to go to an indoor waterpark but haven’t had the opportunity yet.. So cool though! Good to know if we ever happen to be on vacation in these areas! Thanks for sharing. I’m located pretty close to Great Wolf Lodge, but have yet to go…..I think it would be a great surprise for the kids if I planned it soon! My kids love GWL and Coco Keys. We go to both often.